An unequal society is a polarized one at all levels. People tend to have not only very distinctive political and social views, but also distinctive brand preferences. Consumers favor brands that mirror their beliefs and emotional aspirations. As a result, advertising strategy in times of inequality might be to market high and low. Though North America has yet to reach the inequality levels of other regions like Latin America, the social gap in the US has widened through the years. Inequality among working-age people has risen steadily since 1980, in total by 25%. This increase in inequality has a created a situation of class warfare. We have seen this through demonstrations from the Occupy Wall Street Movement and the political paralysis of our congress. This class warfare goes beyond the social and political arena. This war also has affected consumers’ brand preferences. Brands are an extension of consumer personas. Brands need to connect with their audience at the emotional level to influence behavior. For instance, in societies with high levels of inequality such as Latin America, brands tend to market high or low, not so much in the middle. The first reason is economic; the middle class is just too small in terms of market size. The second reason is sociological. This middle class tends to consume high and low. On one hand, they want to be associated with high-end brands to gain perceived social mobility. On the other hand, they consume low-end brands in non-aspirational categories to save money. In simple terms, a middle class person will go for Rolex rather than Seiko even though they might have to incur significant levels of debt. However, the same person will go to a discount store to save on groceries. The US is not Latin America. There are significant cultural and economical differences. Still, the increase in inequality levels has affected consumer brand preferences in the US. Low and high brands are growing while middle brands are declining. Value brand such as Wal-Mart, Hyundai and McDonalds are doing well. Luxury brands such as Tiffany, Rolex, and Mercedes Benz have also posted strong gains. However, middle brands such as GAP, Sears, and T.G.I. Friday are struggling. I understand that there are many factors that affect the performance of a brand. However, my point is that social inequality tends to translate to brand inequality. Advertising in times of inequality may suggest marketing high and low, and not so much in the middle. 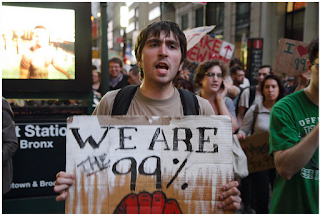 Your poster picture "We are 99%" is not an example of Social Inequity. It is an example of two items we found observing this. First the socialist/communist political movement and in particular radicalism designed at disruption and crisis creation is the nut in this activity. Second many involved have IPhone like possessions and well off families and are lost in false promises of their educations. They are looking for someone to provide for them. Now that is something interesting to translate into branding and marketing. The concept I do not want to work for it, I do not like others who have achieved it and gimme it now without effort. Central to all this inequity is the relationship of growing central government and controlled markets. That item is the real new branding and marketing challenge. Products, services and behavior in government controlled markets.